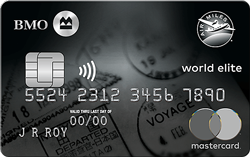 The full amount of the passage fare must be paid for using your BMO Air Miles World Elite MasterCard and/or your earned loyalty points, and the loss must occur within 1 year of the accident in order for coverage to apply. Call Allianz Global Assistance at 1-877-704-0341 (Canada or US) immediately or as soon as reasonably possible. This insurance plan covers most items purchased anywhere in the world for 90 days from the date of purchase. If the item is stolen or damaged, it will be repaired, replaced or you will be reimbursed for the purchase price. Only items that were paid for in full with your BMO Air Miles World Elite MasterCard or obtained through the redemption of loyalty points are covered by this plan. Note: Coverage applies only when the full or partial cost of the trip is charged to your BMO Air Miles World Elite MasterCard. Note: Coverage applies only when the full or partial cost of the trip is charged to your BMO Air Miles World Elite MasterCard and expenses must be incurred as a result of the delay. In the event of a medical emergency occurring during the first 15 days of a trip outside of your home province, you will be covered up to $2,000,000 for any medical expenses incurred.